Private, well kept lake home in musky country. Where you can begin each day with a cup of coffee on the deck, listening for loons, while enjoying one of the finest wilderness views the Chippewa Flowage has to offer. Spend the summer nights on the screen porch enjoying the sounds and smells of the North in comfort, or enjoy a campfire cookout at the lakeside fire pit. 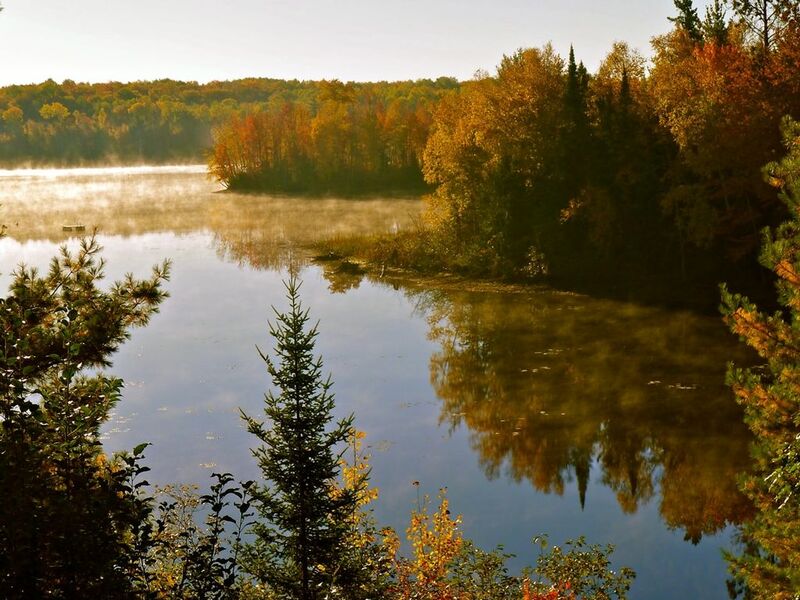 Located on the Chippewa Flowage in a position that allows you to fish Walleye, Muskie, or panfish in the Big Chip, or if you choose, float the West fork of the Chippewa river right back to the dock for some trophy small mouth bass and fast action Muskie fishing. All that catch and release really works! Tie up your boat to the large private dock, electricity available lakeside to keep a charge in the batteries. Boat rentals and launching available at several different resorts within a short drive. You can reach any spot on the entire Chippewa Flowage from our dock. Home is located on 20-plus acres near the Chequemagon National Forest, perfectly located for mountain biking, hiking, hunting, or just exploring. During the winter you can snowshoe or cross country ski on the Flowage or take a short drive to the American Birkebeiner ski trail. If your not up to a nordic ski on the Birkie there are other less challenging groomed ski trails in the Hayward area. Snowmobile trail network begins one-fourth mile away with hundreds of miles of groomed trails and 200 miles of lake shoreline to be explored. My wife and I have lived our lives in the Hayward area. As a family we spend as much time as we can on the Flowage. We use & love it year round. We built the cabin in 1990 as our year round residence. The location cannot be improved upon. Easy access to Hayward and Winter, surrounded by national forest, navigable water to any other point on the Flowage and slow no wake zones keep away jet skiers and most boating traffic. It has played host to many of our best family memories. Unmatched privacy on this body of water. Boat and fish anywhere on the Chippewa Flowage or Paddle the West Fork of the Chippewa river from Moose lake back to our dock using the supplied canoe. Beautiful and private setting on the famous Chippewa Flowage, one of Wisconsin's best waterways. fair to good cell coverage wifi link to cell phone provides great calling. portable style at the request of some of our previous guest. several regional books from local authors. 2 kayaks and a canoe are included with rental. We can help arrange fishing or pontoon boat rental. many golf opportunities are within a minimal drive. Great family vacation Home is beautiful and large! Thank you! This was a great vacation.Home is larger than pictures show. We had plenty of room and privacy. Lot us nice size we took use of the provided kayaks. Rented a pontoon boat and kept it at the dock did some fishing and lots of eagle viewing.Enjoyed local restaurants and Hayward shopping. Two of our crew went to the Apostle islands only 1 1/2 hrs away on a day trip. Had a great time would definitely come back again. Roger and Heidi thank you so much for sharing your home! We enjoyed this cabin for the second year with family and friends. Great view and plenty of room to accommodate a family with children or a getaway for friends. Not too far to Hayward for a day trip, and right on the water to enjoy fishing and boating. Great area to kayak as well. Cabin has a well stocked kitchen (cookware, utensils, and dinnerware) for preparing meals. The only drawback is the steeper hill between the dock and the cabin. Great place to relax, see the eagles flying, and hear the lions calling. Thank you Roger and Heidi for sharing your property with my family. It was one of the best vacations we have been on. My dad and husband had a great time fishing (they caught mostly crappie, walleye...yummy). We enjoyed exploring Hayward and the lumberjack show. But mostly we loved hanging out as a family (pups included) relaxing, sitting around the campfire, and making family meals. The cabin was great and definitely more than what I was expecting. It felt like a home and had everything needed to be comfortable and little bonuses like coffee filters, some tea bags, dish soap, and a sewing kit that came in handy to fix my kiddos purse! If you have any issues Roger will address it immediately. There was a minor issue with the dock when we arrived and it was corrected very quickly. Views are great, house is clean and nicely equipped. If you have mobility issues you will need to consider the steps into the house and the slope to the lake as they are a little steep. I have problems with my knees and it was somewhat an issue, I just had to go slow and all was ok, getting old I guess. I would recommend this house for others. ATV trails are close and easily accessible from the house. Bring plenty of bug juice as they are busy buggers. There is noTV which wasn't a problem for us, we used Netflix and Youtube for movies. Internet was good also. Thank you Roger and Heidi for a pleasant vacation. If you need fishing tips go to Genkes Baitshop he is very helpful. We just returned from a week in this bright, clean, comfortable home on the Chippewa Flowage. We especially loved the second-floor deck AND separate screened-in porch that allowed us to survey the area while drinking coffee in the morning, all four of our dogs safely by our sides. And we enjoyed sitting on the deck in the evenings star gazing. The dogs loved the yard and small beach. Boat rides and fishing were equally fun. Check it out. You won't regret it.